It's no secret that I love wine and one my favourite places in the city is the iYellow Wine Club. The space is beautiful, the people are amazing and the wine is always flowing. So when I was invited out for the PURE or EXTRAVAGANZA Trapiche Wines Tasting, I of course, said yes! (Detox be damned!) When my friends at iYellow Wine Club told me to come prepared for the unexpected...I wasn't quite sure what to think! The night started out at a different venue, the Ritz Carlton. 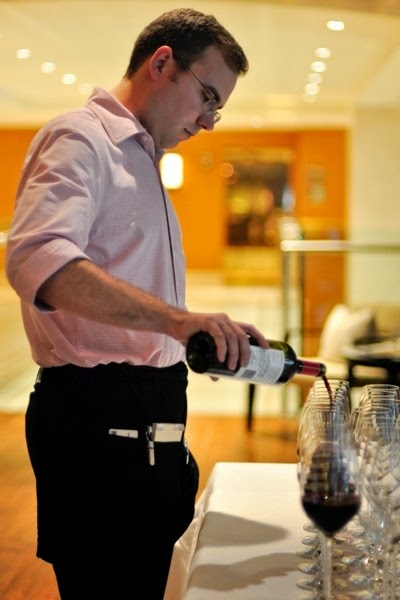 The crowd met at the Ritz for the first of two tastings that night - the PURE Malbec. Tying into the "pure" theme - everything here was kept simple, yet elegant. The Trapiche Pure Malbec was paired with rich, dark chocolates, sharp pecorino cheese and steak bites. We listened to the team from Trapiche Wines explain the background of the vineyard as well as the making of the Pure Malbec. As well, the resident artist at the Ritz Carlton, Jacqueline Poirier, was in attendance and painted an amazing plate for Trapiche Pure Malbec. Side note: isn't that just the coolest job ever? "Oh, what do I do for a living? Well, I paint amazing pieces onto plates at the Ritz Carlton. NBD"
Anywho - back to the wine! Trapiche Pure Malbec is 100% Malbec, no blends - completely unoaked. It was delicious! Smelling the wine you could smell cherries and plums and there was a smooth, lasting finish to the wine. I'm finding myself leaning more and more towards red wine lately - and this is one I would highly recommend, especially when it is priced at $15.95 in the LCBO! Next up - we sauntered over to the iYellow Wine Cave, also known as my second home. #NotKidding. After speaking with a few members of the iYellow Wine Club team - they told me to brace myself - that I was in for a world of surprises! My anxiety started to get the best of me and I was (silently) nervous while heading over. I knew the deal - the entrance is in an alley - others who had never been were skeptical. However, while walking down the alley we were greeted by the ever-so-lovely Angela from iYellow Wine Club, standing in front of the usually graffiti covered doors which were now covered with red satin. Oh - the surprises didn't end there! Walking downstairs I was overwhelmed with a scent of something delicious! 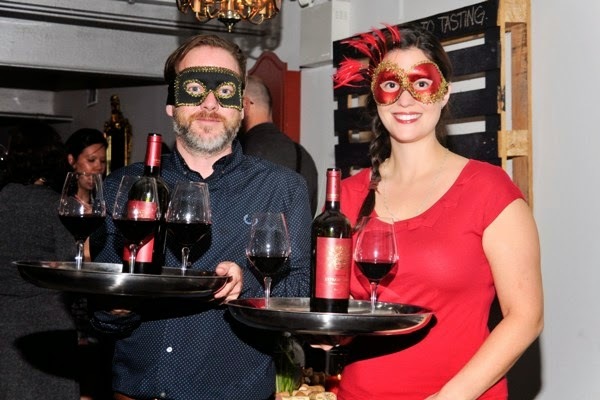 Greeted by my lovely masked friends - I took a glass of Trapiche Extravangza and was on the hunt for the delicious food! Now, I have mentioned many times in the past that I've been a...picky eater over the years, not always up for trying new things. (Yes - I just had a cucumber for the first time only in 2011 - DON'T JUDGE ME!) But I just knew I had to try whatever it was that I was smelling...and what I was smelling was...frog legs. 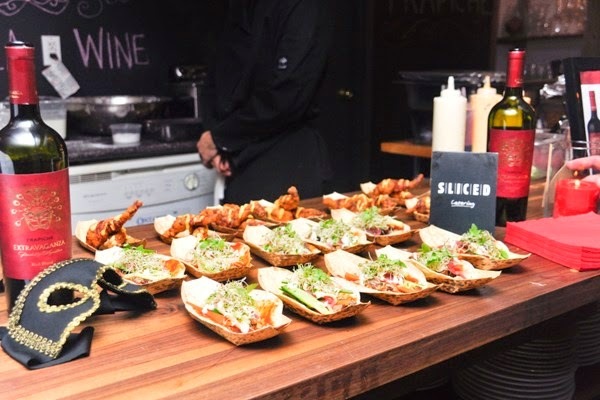 Partnering with SLICED Catering, the iYellow Wine Club team and Trapiche Wines came up with quite the menu for the Extravaganza event! Deep Fried Frog Legs with an Extravaganza glaze and kimchi aioli, Duck Tongue Tacos with pickled onions and smoked Extravaganza chutney. And for dessert? Oh, well this one was EXTRA special! 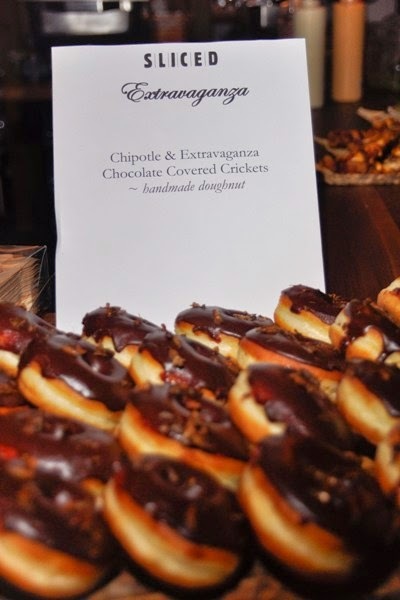 Chipotle and Extravaganza Chocolate Covered Crickets atop homemade doughnuts. Yeah...they went there...but I passed on the bugs. I still have my limits! 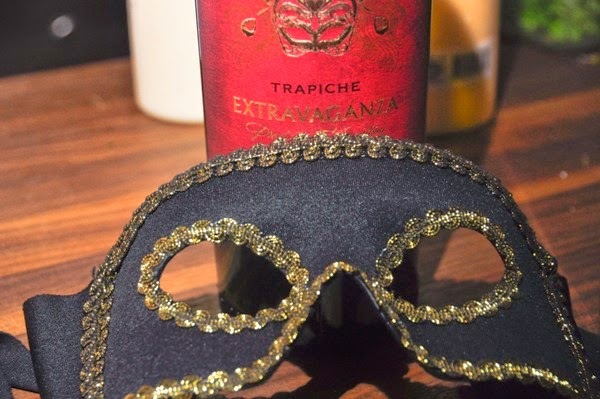 The Trapiche Extravaganza is a red blend with Malbec, Bonarda and Syrah. This wine had a bit more spice to it than the Pure Malbec, but was still delicious. A richer taste, the finish was refreshing and made for easy sipping. Paired with the food choices offered - it was a perfect match. Priced at $16.95, the Extravaganza is another affordable - yet delicious - option. Do you have a preference on your reds? Disclaimer: Credit for all pics except the Deep Fried Frog Legs goes to Moe Laverty.